UNIVERSITY PLACE, Wash. -- In his mind, Jordan Spieth had waged a valiant fight against a penal colony of a golf course, against heavy self-imposed pressure to win the U.S. Open, and still he had come up empty. Somehow he had double-bogeyed the 17th at Chambers Bay, and so the birdie at the 72nd hole would prove irrelevant with Dustin Johnson about to win on an eagle try from 13 feet. Spieth was behind closed doors in the scoring area, locked away with the local caddie, Michael Greller, who had gotten married at this place. The Masters champion told Greller that Johnson would be the one to propose a champagne toast at the club Sunday night, that the best athlete on tour, a guy who looks and moves like an NBA small forward, was about to dunk their Grand Slam dream in the cool waters of Puget Sound. "What did I do?" Spieth asked the caddie of the comfortable 3-shot lead he'd carried away from the 16th green. "How did I possibly let this happen?" Greller knew that bat-spit crazy things happen all the time in golf, and that players far more accomplished than Johnson, a slugger who had never won a major, made ungodly messes of easier opportunities than the one confronting Wayne Gretzky's future son-in-law at that very moment. And sure enough, on cue, Johnson ran his eagle putt 4 feet past the cup, and then Scott Hoch-ed the comebacker that would've landed him in an 18-hole playoff. Spieth and Greller didn't know what to say or how to act. The caddie finally rose from his chair and said, "Dude, give me a hug. You did it." And that was that. 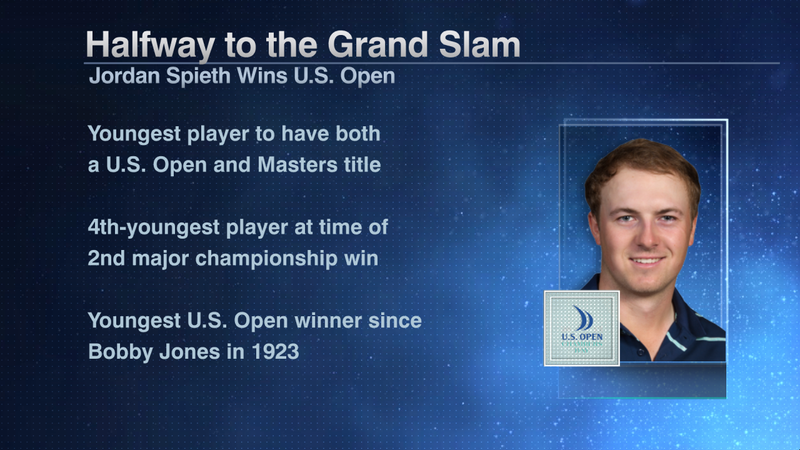 Jordan Alexander Spieth, 21, had become the youngest player to win the Masters and U.S. Open in the same year, the sport's youngest national champ since Bobby Jones in 1923, and the youngest man to win a second major since Gene Sarazen in 1922. Outside the scoring trailer, listening on their miniature radio devices, the Spieth family couldn't believe their ears. Jordan's brother, Steven, a basketball player at Brown University, thought for sure Johnson would knock down the eagle putt for the outright victory, or at least force the Spieths to return Monday for one more draining duel in the sun. "It's never a good thing to root against anyone," Steven said, "but we were asking ourselves if it's OK to cheer if Dustin misses his second putt." Dustin missed his second putt. "And then instinct took over," Steven said, "and we let out a yelp." The brother and the parents, Shawn and Chris, were allowed their emotional response to a stunning miss that inspired this historic development. Chris Spieth said she felt like crying after her son followed his remarkable birdie putt at the 16th with his meltdown at 17, and that the seconds before Johnson's second putt at 18, waiting for the crowd reaction to tell the family what had gone down before the radio announcers could, "felt like 10 months." Yes, it was worth the wait. 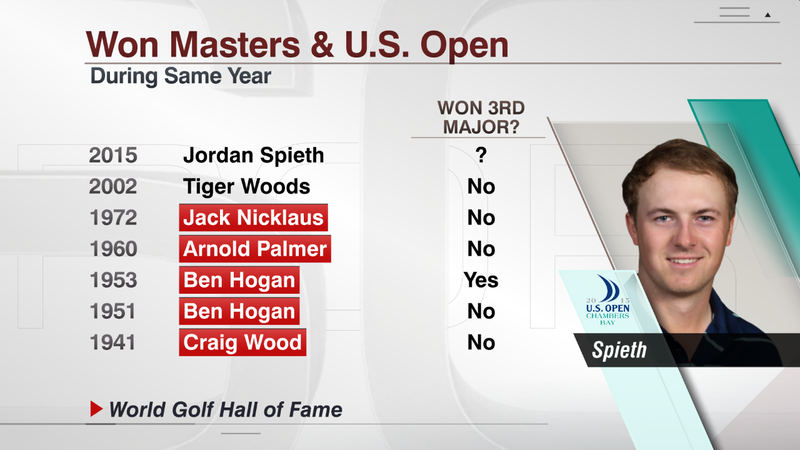 Spieth didn't merely join Tiger Woods, Jack Nicklaus, Arnold Palmer, Ben Hogan and Craig Wood as the only men to follow a victory at Augusta National with one at the next U.S. Open. He also showed millions of viewers why he is good enough to become the first player ever to win the calendar year Grand Slam in the Masters era. If Spieth won on raw talent and precision at Augusta, he proved Sunday he can win a big one on blood and guts, too, just like Rory McIlroy proved he could do at the PGA Championship last year. Spieth also proved he can win a major on a links course (or at least a close facsimile of a links course); he'll take his next two cracks at the Open Championship at St. Andrews and then the PGA at linksy Whistling Straits. But it was the fight he showed against the field and the treacherous Chambers Bay greens, a fight he won with B-game execution that told any right-minded witness that Spieth is very capable of matching Woods' remarkable Tiger Slam (three straight majors victories in 2000, followed by another Masters title in 2001), and putting a cherry on top by squeezing his into a single season. At Augusta in April, Spieth said, "I was on and making everything and striking the ball fantastic." He couldn't say anything of the sort about his performance at Chambers Bay, where he grinded from bunker to bunker, dune to dune, and scared any opponent watching -- McIlroy included -- with overwhelming evidence that he can find two dozen different ways to win a tournament, the conditions of the greens be damned. "And he's an incredible thinker ... Think about what he went through standing on the 18th tee, having a 3-shot lead and doing what he did [on 17] and then hearing the roar from Dustin's group. And now all of a sudden he goes, 'I've got a 3-shot lead, too, I'm tied.' Think about the emotions going through it. The chances of him winning [the Grand Slam], the odds are not great. But he is absolutely capable of it." Davis spoke after Spieth was awarded his trophy and his Jack Nicklaus gold medal as the shadows behind him stretched across the 18th fairway, the place where he'd struck his titanic 3-wood while standing 282 yards from the hole. The fans had chanted his name, and Spieth had clapped for them, and waved his cap, before ultimately getting around to dedicating this Father's Day gift to his old man Shawn. He called his final round "as nerve-wracking as I've ever experienced," and yet when he was out there surveying some of the major-less contenders, Johnson included, Spieth kept telling his caddie, "We've done it before. These guys haven't." He sank the magical putt at 16 while the man he was paired with, Branden Grace, completely fell apart, and then released a primal scream that rose up from his toes. "That was about as animated as I've been," Spieth said, "since maybe throwing a tantrum when I was 13." No need for any tantrum Sunday. In the moments after Johnson gagged his second putt on the 72nd hole, the delirious family Spieth was left to confront this simple question: Do you believe Jordan is capable of winning all four majors and pulling off one of the greatest feats in sports history? Steven: "Absolutely. If he didn't prove it today, I don't know when he would. I think he's got to be the favorite in any tournament he plays in." Chris: "Absolutely. He's got more confidence than anyone this year ... He's won in different ways now, and not a lot of guys have that experience. In Jordan's mind, he knows he can do it both ways." Shawn: "Yeah, I think he can, absolutely. The U.S. Open is probably the hardest one, and people expected the hardest one for him ... He loves links golf, so he'll have his chances. It's on different venues for both the PGA and Open Championship every year, so they'll be golf courses that suit him and I think he'll have a really good chance. Grand Slam in one year? It's still alive, the dream's still alive. There's only one guy that has that, so that's really special." As the sun faded over Puget Sound on Sunday, Spieth was wearing that Jack Nicklaus medal and kissing the U.S. Open trophy and calling St. Andrews one of his favorite places in the world. He was shocked he'd won at Chambers Bay without needing a playoff, but not surprised he was halfway home to the biggest prize in golf. At his winner's news conference at Augusta National, Spieth was asked about heading to St. Andrews as the reigning Masters champ. He talked up the history of the place, and pointed out that Scotland might have the game's most knowledgeable fans. And then he said, "Hopefully at that point, maybe go for the third leg of a Grand Slam." That evening, considering the zillion-to-one possibilities, many reporters sitting in Spieth's presence laughed.